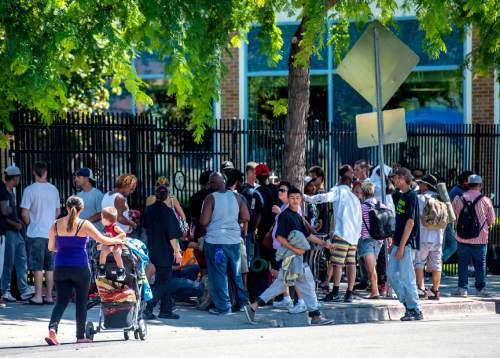 Council members concerned about impact of two 250-bed homeless shelters on SLC community. Francisco Kjolseth | Tribune file photo The Legislature and other political leaders are making serious attempts to address homelessness, with a first step to site two new smaller shelters -- 250 beds each -- in Salt Lake City to take pressure off The Road Home shelter on Rio Grande Street. 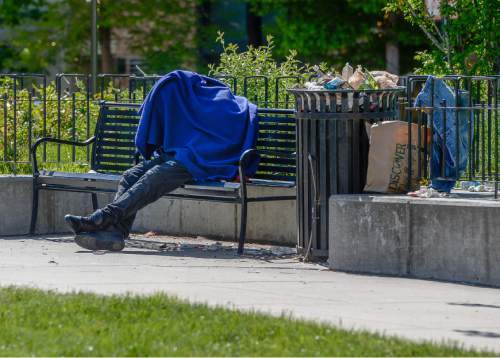 Chris Detrick | Tribune file photo The Legislature and other political leaders are making serious attempts to address homelessness, with a first step to site two new smaller shelters ó 250 beds each ó in Salt Lake City to take pressure off The Road Home shelter on Rio Grande Street. The Salt Lake City Council thus far has had no input on where to build two new homeless shelters in the capital city, and the window for selecting them is closing fast. It has left council members anxious and frustrated. "We have to consider quality of life for those we are serving in the community," said Councilwoman Erin Mendenhall. "[And] we could easily be left out of the process." The process appears to be in flux as the Salt Lake City mayor&apos;s site-selection committee and Salt Lake County&apos;s collective impact initiative strive for a site-selection decision by fall. That is said to be necessary in order to demonstrate progress to the Legislature, which has allocated $9.4 million this year for new homeless facilities and service upgrades. Homeless advocates are seeking two more years of similar amounts from state lawmakers. Salt Lake City Mayor Jackie Biskupski has held meetings and workshops throughout the community on the proposed two 250-bed shelters aimed at taking pressure off The Road Home shelter on Rio Grande Street. Biskupski spokesman Matthew Rojas said earlier that the mayor would make the final decision but that the council would play a role. But before the state funding can be released, Biskupski must reach an accord on site selection with Salt Lake County Mayor Ben McAdams  making the matter more murky. On Tuesday, McAdams told the council that site selections for two 250-bed shelters should be made by September. Nonetheless, David Litvack, Biskupski&apos;s deputy chief of staff, said it would be more like mid-October, but he wouldn&apos;t commit to a specific date. It could be as late as November, he said. Council members say they are responsible for the well-being of the community and want a transparent process with a lot of public input. Councilman Charlie Luke is concerned about the impact a 250-bed shelter would have on any Salt Lake City neighborhood. He and Mendenhall questioned the size and design put forward by McAdams and his collective impact team and wondered how such a shelter would fit into a community. "The renderings from the county [of the proposed shelters] are very institutional in nature," he said. "Among my concerns is that the city will have limited ability to determine what those facilities look like. You can&apos;t just plop something down." Mendenhall said a 250-bed shelter is too big, particularly one that would be specified as a women-only facility because there are only about half that number of single women at The Road Home shelter. That, she fears, would lead to opening the facility to include single men to fill the beds. "We know women are victimized in shelters more than men," Mendenhall said. "That will keep some women from even considering a shelter option." Councilman Andrew Johnston, who sits on the mayor&apos;s site-selection committee, said shelter location should be determined by accessibility to services and transportation, as well as its ability to be integrated into the surrounding neighborhood. "A large shelter wouldn&apos;t fit well in some neighborhoods," he said. "But in some high-density areas downtown, it wouldn&apos;t stick out as much." Ideally, the plans for two new shelters would go to legislators in September or October in advance of the January legislative session, Johnston said. That would help ensure continued funding. "The frustrating thing is that nobody has the definite answers yet," Johnston said. "And we&apos;re on a tight time frame." But Litvack said the site selection will come together sometime this fall with input from the council and the community. "We want to make sure that we don&apos;t short-circuit public engagement," he said. The mayor&apos;s site-selection committee will soon recommend five potential sites, Litvack said. Two of those will be selected as locations for the shelters.